Working in a Montessori environment, I'm always asking myself how to build in choice and opportunities for independence for the students. 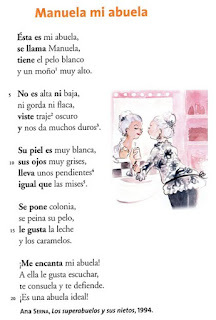 I notice that a lot world language teachers are working on this-because, of course the goal is for the students to be able to be independent and use the language with speakers of the language out in the world. 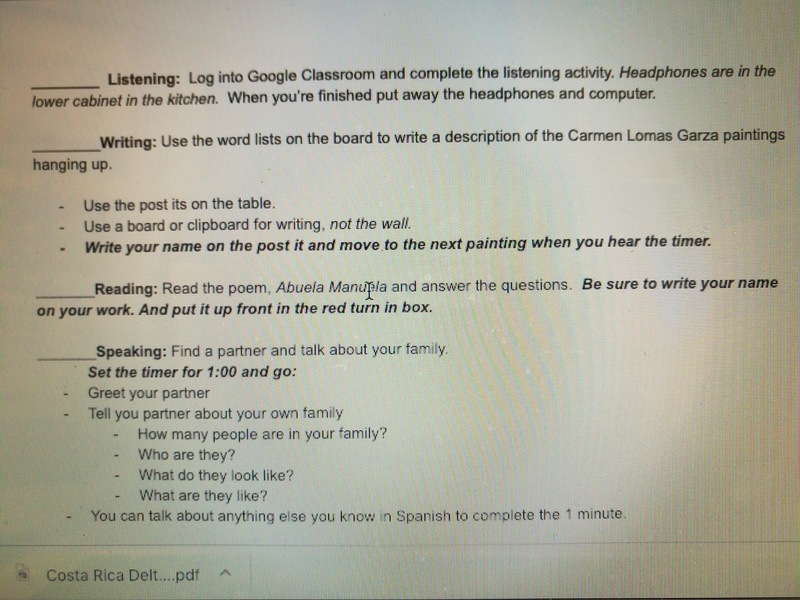 I like the idea of stations, or works, so I've been experimenting with how to use a Montessori like work plan to build in some self direction and independence. 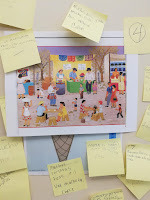 I am not doing this every class, but when asked for feedback, the children really enjoy the format to do occasionally. 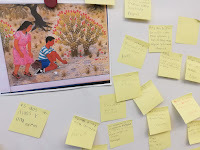 What I like about it is that it allows for them to make a choice on what they work, based on what is available at any given time, and I was free to both observe them and connect with children one on one--something that is a challenge in our tightly packed FLES schedule. 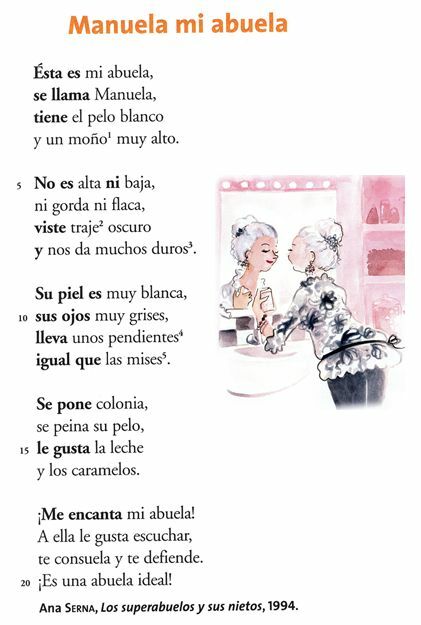 During the work periods that I did with 9-12 students (4, 5, 6th gr), I also noticed that the children relied on each other to answer questions(good ol "Three before me. "), allowing them to be more independent. 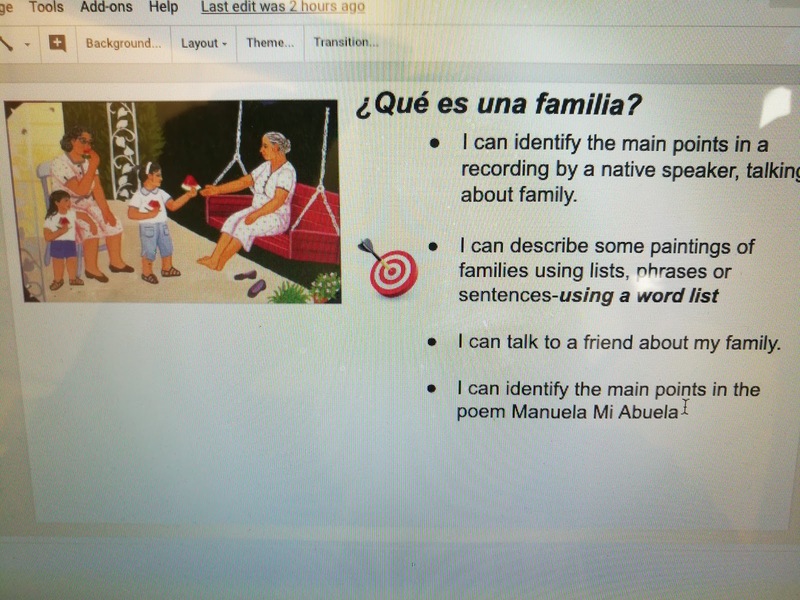 Below are some samples from the 5th grade unit, "What makes a family?" As the children entered the classroom, I greeted them at the door, as usual, but this time with their plans, and they got to work right away. 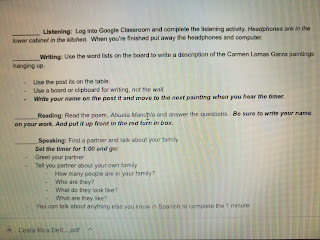 Choices included listening to an audiolingua recording and answering interpretive questions in Google Forms, doing a gallery walk of paintings by Carmen Lomas Garza while writing a post-it sized description(with a word list on the board), choosing a partner to talk with at the "chat station" in one of our reading corners*, and reading the poem "Manuela, mi abuela," and answering interpretive questions. 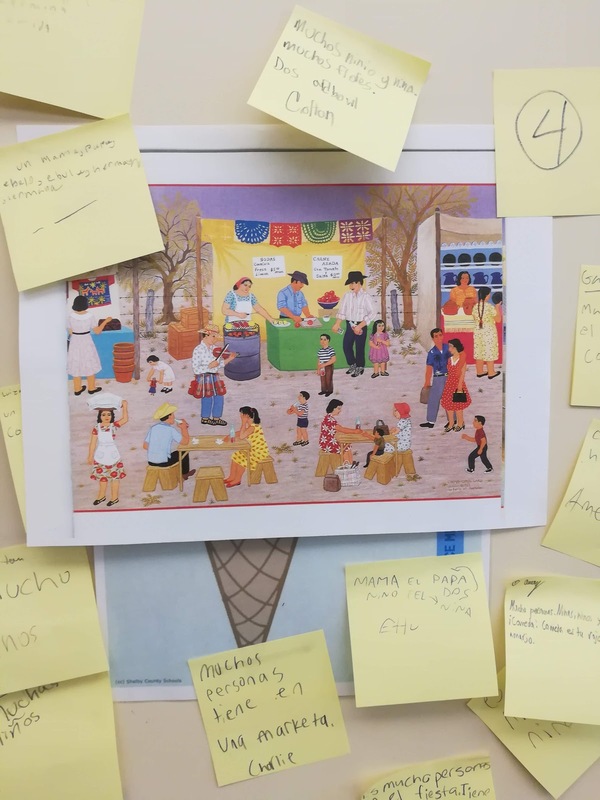 When some children finished sooner than others in the group, we always have free reading and the choice works(aka fast finishers) that are mostly Rockalingua activities laminated with dry erase markers for them to use--plus the Mira tu Mundo magazines from Mundo de Pepita--in sheet protectors, so children can complete the activities and erase when done. *In my school setting, talking about family is generally a totally cool subject. But I think it's worth mentioning that not all kids feel good talking about their families. I am looking to add to this task: talk with your partner about the family in the picture--using family pictures from the Peter Menzel books and UNICEF children's books, etc....Describe what you see. 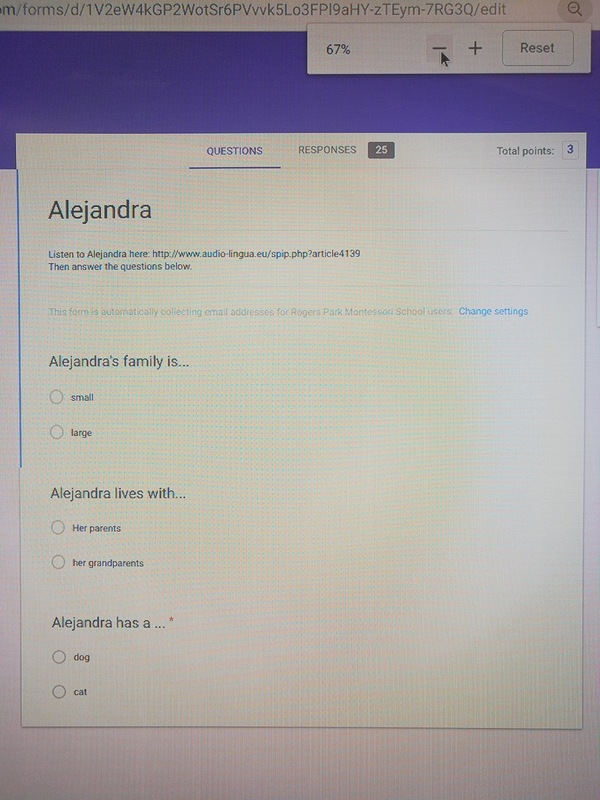 What questions could you ask the family? I noticed that this activity may take more than one 30 minute class period, which is fine. When the children came in next time, they picked up where they left off. 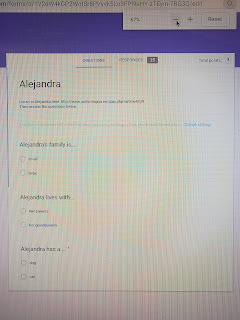 I'm also experimenting with using Edpuzzle as input tool, and Flipgrid for documenting their interpersonal work--I'd like to build toward having the children respond to each other's Flipgrid posts--I'll keep you posted. Progress not Perfection.